Last Date for receipt of filled in B.Ed., admission application for 2018-2019 has been extended upto 30.11.2018. Last Date Extended upto 09.11.2018(with fine) For Receipt of Applications for School of Distance Education December 2018 Examinations. Affiliated Colleges - November / December 2018 Examinations - UG Time Table - Notification. Affiliated Colleges - November / December 2018 Examinations - PG Time Table - Notification. School of Distance Education - December 2018 Examinations - Notification. Examination Notification November 2018 - For Private Candidates. School of Distance Education - June 2018 Examinations - Revaluation Results(All Courses). School of Distance Education - June 2018 Examination Results(All Courses). Results of B.Ed. MAY 2018 SDE Examinations. National Seminar on "Digital Humanities in Literature" organized by Department of English & Foreign Languages. National Conference on "Biology and Medicine(NCBM-2019)" Jointly organized by Department of Zoology & Department of Human Genetics and Molecular Biology. Faculty Development Programme on Machine Learning 2019(FDPML'19) organized by Department of Computer Science. National Workshop on "Statistical Machine Learning Techniques" organized by Department of Statistics. National Conference on "Statistical Theory,Modeling and Applications(NCoSTMaA)" organized by Department of Statistics. International Conference on "Mathematical Modelling in Science and Engineering(ICMMSE 2019)" organized by Department of Mathematics. National Conference on "Advanced Computing" organized by Department of Computer Science. Department of Library and Information Science - Walk in Interview(Last Date: 28-11-2018). We are happy to announce that ALUMNI MEET 2018 has been planned on 23-DEC-2018 by BUAA and Alumni of Bharathiar University are advised to register and take part in the occasion. Last date for submission of Expression of Interest(EoI) Application to act as Learner Support Centre(LSC) for operating the programs of Distance Education as per UGC(Open and Distance Learning) Regulations 2017 has been exteded upto 31.08.2018. Introduction of B.Voc,D.Voc, Diploma in Skill courses from the academic year 2018-2019 by AICTE. Circular - All the Study Centres of School of Distance Education, Bharathiar University situated outside the State of Tamilnadu shall be closed. Circular - No Private Franchise in any form be entertained within the State of Tamilnadu as Study Centres of BU-SDE from the academic year 2018-19 and onwards. Bharathiar University has achieved the 13th Rank among the Indian Universities and 20th Rank under Over all Category of NIRF Ranking-2018 by MHRD, Government of India. Bharathiar University is the only State Arts & Science University to top the list at the National Level. 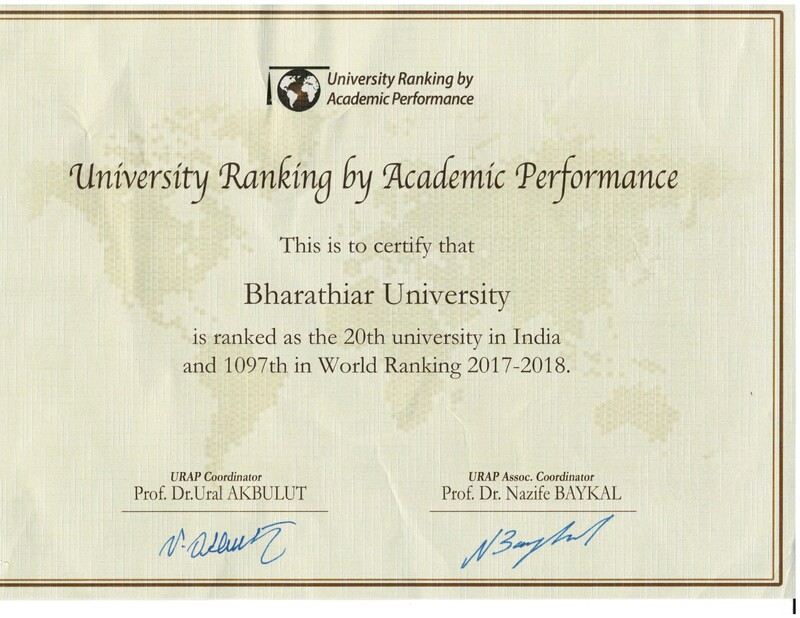 Bharathiar University is ranked as the 20th University in India and 1097th in World Ranking 2017-2018. Bishop Thorp College,Dharapuram is deaffiliated from Bharathiar University.The College should not make any admission from the academic year 2018-19 and the current students who are studying in the college are allowed to complete the course.